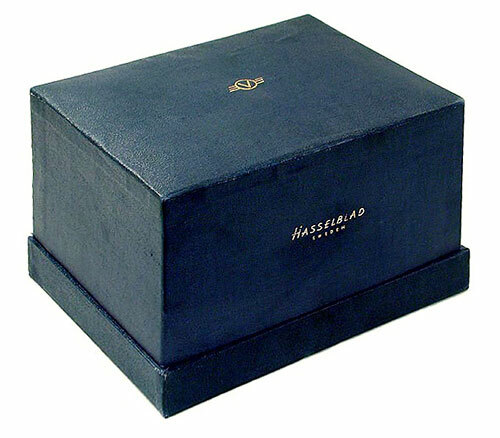 It is difficult, in this first ever compilation attempt about boxes used for packaging Hasselblad products, to be totally comprehensive and absolutely accurate. It is necessary to be somewhat speculative to assign dates to when specific types of packaging were in use but this does not deter us from trying! It has to be noted that no contemporary documentation precedes this attempt – no one has been foolish enough to do this kind of a compilation. Catalogue and price lists never mention boxes nor do they show the packaging in any photographs. Unfortunately advertisements, which can often be important in dating camera equipment are also devoid of any pictures of boxes. Instruction books, which also could yield the most definitive dates, lack photographs of boxes. Lacking conventional documentation, it is necessary to deduce the approximate time of introduction from sample outfits of boxes and associated cameras. This type of painfully slow research depends on the availability of a significant number of outfit samples so that the oddball misrepresentations can be sorted away from the outfits that are correct in all respects. We have attempted to contact persons who might have complete and representative outfits. This then is a presentation of the “facts” as we understand them today. With help from others with interest in this aspect of Hasselblad History from documented camera/box outfits we should be able to further improve the accuracy of what we know. Boxes may have been, in some instances, separated from the correct camera outfit and mated to a camera outfit belonging to a different time period in the chronology. So it is very important to provide every detail possible so one can assess the originality of the sample. Information items that can be crucial include camera serial number, magazine serial number(s), and lens serial number. Another important piece of information is provenance – obviously an outfit from the original owner or which has been in a family since new or with all matching components represents a more credible box / camera example than ones that do not. Another detail of the boxes are the protective or decorative outer wrapping outside these boxes. Camera boxes were protected by corrugated cardboard outer boxes or wrapping paper which were, in most cases discarded by the retail agent. If the outer box / slip cover was given to the purchaser, it was often discarded at this stage. These outer boxes or paper wrappers are important because they carry identification labels which provide the serial number of the camera, magazine and lens. So if the outer box has not been separated from the box, it gives the most definitive information that we can locate. However these outer boxes / slip covers are extremely rare – even more so than the original inner boxes. The photographs of the boxes are presented in color (mostly) because that is one of the more distinctive features of the boxes. Unfortunately, some boxes have been discolored by soiling through handling and faded by exposure to sunlight. The degrees of soiling and fading are variable so we must be prepared to accept some variability in the color of the samples we encounter. Boxes that have remained protected by the outer boxes are likely to be closest to the nearest to the original color. Photographing these boxes and representing the colors accurately is a difficult task and you will see considerable range due only to the type of lighting used. One final complication must be mentioned regarding dating the boxes from the camera contents. The cameras will be correctly dated by the serial number code reflecting the date of camera manufacture. There may, however, be a substantial discrepancy between the date of the camera and the date of the box. Cameras were manufactured and placed into inventory to await orders from distributors. When an order was in hand the appropriate number of cameras were retrieved, boxed and shipped. The then current boxes may have been several months to two years later than the camera contained within. A good example could be the SuperWide cameras. 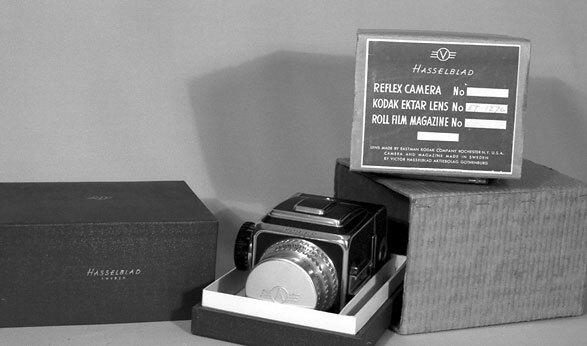 Some SuperWide cameras manufactured in 1957 were delivered as late as 1959, so in this exmple, a 1957 camera could be mated to a 1959 box at shipping time. One resource that can be used to assist in determining correct shipping dates is reference to the shipping information from the factory ledger books. The 1600 F camera box is a strikingly distinctive box. The 1600 F box is medium dark blue in color with gold logo and text embossing. The thin blue material covering the stiff cardboard has what appears to be a simulated linen texture. The front face has “Hasselblad” in gold tilted letters above “Sweden” in smaller upright block print. The remaining three sides are clear of lettering. The top is not perfectly flat but is slightly raised towards the center and it bears a 22 mm wide flying V logo. The top fits over a 15 mm raised lip of the bottom and rests on a blue basal border that is 22 mm high. The basal border is about 1 mm wider and longer than the top on all sides. The base is 18.4 cm long by 14 cm wide, the box is 11.3 cm high. The top fits properly over the base in only one orientation. The inside of the base has raised front, back and lateral guides to keep the camera from shifting about. At the back of the base there is a 15 mm wide compartment separated from the camera by a thin white cardboard. This compartment runs the full length of the box. The compartment holds a 15 cm long, plastic covered cable release with a red button lock for time exposures. The threads are of the non-tapered type to match the special non-tapered cable release holder on the camera’s right side. The width of this compartment is a perfect fit for a folded neck strap. Both the cable release and a neck strap seem to have been furnished with the camera. Other materials included were the 1600 F instruction book with yellow covers, a registration card in an envelope, a card describing the waist level viewer (WLV) operation, and a card inserted in the rollfilm magazine with instructions for film loading. Boxes could be used to ship a complete camera (body, film magazine and lens) or the body and film magazine only – the typical case for cameras shipped to USA where the lens was added to the body and magazine there before shipping to dealers. In this case a wood and paper retainer held the body in place and prevented it moving around in the box. It is of some interest to note that many of us take for granted that the Flying V logo referred to V as in Victor Hasselblad. In October 11 through 16, 1948 however, when The USA distributing agent, Willoughby’s, introduced the camera to the press and public at the Cleveland Convention of the Master Photo Dealers and Finishers (MPDFA) they used the circled V to preface Versatile on some of the advertising literature (refer to page 74 of the Hasselblad Compendium). This distinctive blue box was protected by two corrugated cardboard outer boxes of which likely there are only a few surviving examples. The outer boxes for all pre 1957 cameras are very rare. The outer brown box is folded around the inside cardboard containing the inner blue box and is stapled not glued at the overlapping joint. When the outer box is removed (a tight fit) the inner corrugated box that is folded around the long dimension is exposed. This brown corrugated slip cover is also a tight fit and is folded so that the ends abut at the top. The abutted ends are joined by brown paper tape. The overall size of the camera package when both the outer boxes in place is 19 cm by 14.7 cm by 12 cm high. A 12.5 cm wide by 10.5 cm high label is affixed to one end of the inner cardboard box. 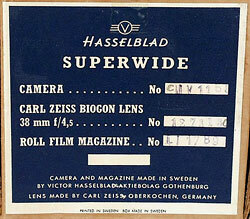 The label has a dark blue field with a logo, the name Hasselblad and blank areas for penciled information about the camera serial number, Kodak Ektar lens serial number and Roll Film Magazine serial number. An unidentified blank rectangle may have been intended for ship date but this latter is speculation because the space remains blank on the only label we examined (the only one we know of that has survived). This Blue “Presentation” Box was in use from about mid-1950 through mid 1953 for almost all of the second series two 1600 F cameras. About 3,000 Blue Boxes must have been shipped out with the cameras. Very few have survived. An open question is as to what kind of a box that the first series of cameras (called Series 1, or null series) were shipped in. Very few of these first 273 null series cameras (about 25 at last count) have survived and we have no examples of any original boxes from these cameras. It seems likely to have been the blue Type One box but we have seen no examples to confirm this. 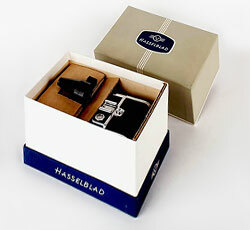 The boxes were made by Robert Skarstedt AB which was a subsidiary of FW Hasselblad and Co. 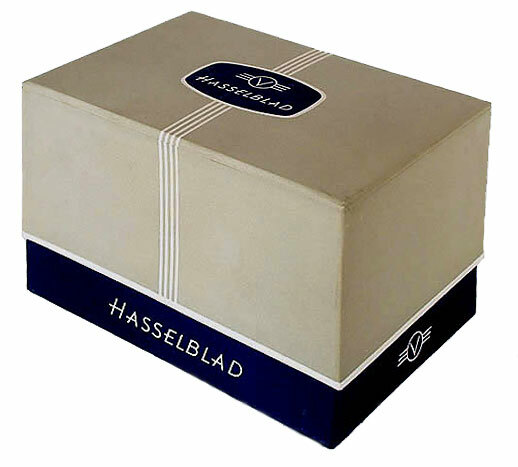 The 1950-1953 vintage accessories were also sold in the same style boxes. Shown below are a magazine box, a box for an extension tube and a flash bar. The film magazine box is distinctive in that the top hinges on the base section – they are not separate. The next design of box was used for the late 1600 F cameras and for the 1000 F cameras introduced in mid-1953 and appears was used up to late 1954 or early 1955. This box is less spectacular in comparison to the striking blue “Presentation” box (the “Type One” box). On this Type Two box the top cover is bluish gray for the earlier boxes and seems to change to a cream gray for the later boxes but the apparent color difference may be entirely due to results of soiling and fading. The base band is dark blue. There is a “squashed oval” logo in dark blue on the top surface. This box is constructed of uncorrugated stiff cardboard covered with printed paper. The box is a nominal 19 cm by 13 cm by 12.5 cm high. The rim at the base is 32 mm high and is dark blue in color. The accompanying photographs show the inscriptions on this dark blue band. The top is gray in color with four stripes running across the top and down the long sides of the box. The top has a logo imprint that is in the shape of a squashed dark blue oval with the flying V logo and Hasselblad inside. The V is upright and has flared branches. Unlike the type 1 box, there was no compartment in the interior to house a release cable. The cable release manufactured during the 1000 F period was covered with black braided cloth and too long to fit in the box without being bent. The cable was not included with the box but sold as a separate accessory. The box had an L shaped corrugated cardboard piece on the bottom and a folded corrugated cardboard insert fitted on the top of the camera to prevent the camera from moving inside the box. The outer protective corrugated slip covers described for the earlier 1600 F box had evolved to an even more secure combination of a double box with an outside corrugated long dimension sleeve protecting a corrugated box with flaps that held the 1600 F/1000 F/SuperWide colored box inside. The dimensions of the package with its outer protective box was 19 x 14.7 x 14.2 cm high. A 12.5 x 12.5 cm dark blue label was affixed to one short end of the corrugated exterior box. Shown below is a 1954 SWA. Below are Type Two boxes for a 1953 (late 1600 F) film magazine and a set of extension tubes. The next box was used for the 1000 F and Super Wide box introduced in 1955 and used to mid 1956. It is dimensionally identical to the Type Two box. The difference is in the colors. 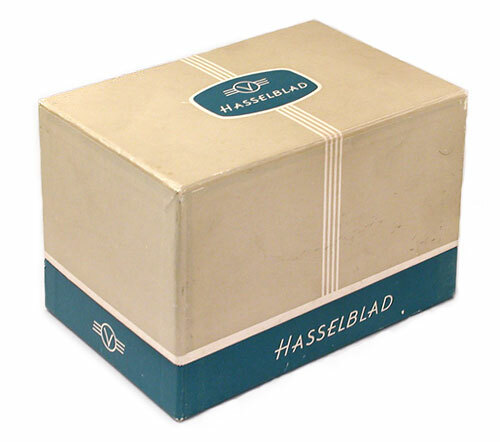 This box has a light creamy gray top and the basal band is light blue (almost turquoise) in color with the same printing as the Type Two box. There are four narrow white stripes running across the top and down the long sides of the top as with the type 2. The oval logo on the top has a light blue color the same as the base. The light blue base still has a script “Hasselblad” in white on the long sides and a flying V logo in white on the short sides. Below are a Type 2 and Type 3 box to contrast the difference in color. 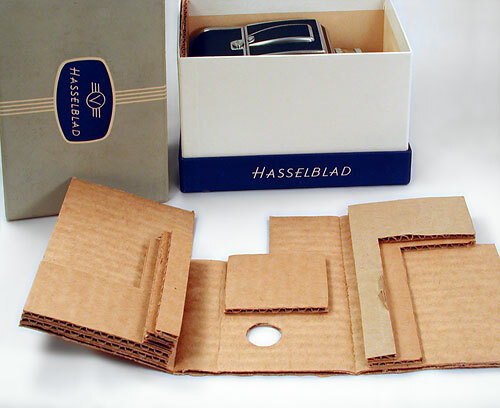 The interior of the Type Three 1000 F box seems not to have the interior corrugated cardboard insert of the Type Two box – only the L shaped corrugated cardboard piece on the bottom to prevent the camera moving in the box. The SWA/SW box did have quite an elaborate interior packing. Corrugated cardboard from long strips is built up by folding and glued to each side of the box. These are glued to the sides just far enough forward of the rear to accommodate a SuperWide body thus securing it in place. The lens protrudes forward in between the two built up blocks where a built up cardboard block is glued to the bottom to support the lens. The viewfinder is removed from the SuperWide and the camera placed in the box. Now another cleverly folded and built up cardboard spacer, this time the full width of the narrow side of the box is placed in front of the SuperWide. This spacer has a square hole cut out at the top to accommodate the viewfinder. The viewfinder rests tightly against the front, back and sides of the hole in this arrangement and is ever so slightly pressed downwards when the top is replaced. 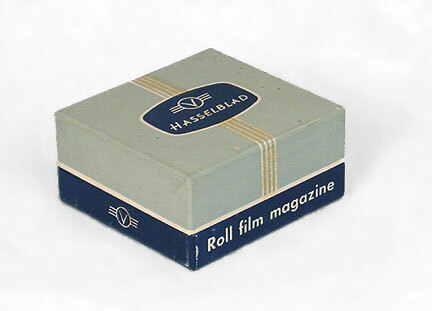 The next box was for the 1000 F/SuperWide box introduced in mid 1956. It is the same size as the Type Two and Three boxes. The difference comes in the printing on the box – there are no thin stripes and there is a change from the “squashed oval” logo to a rectangular logo. The flying V printing is much larger and straight branched. 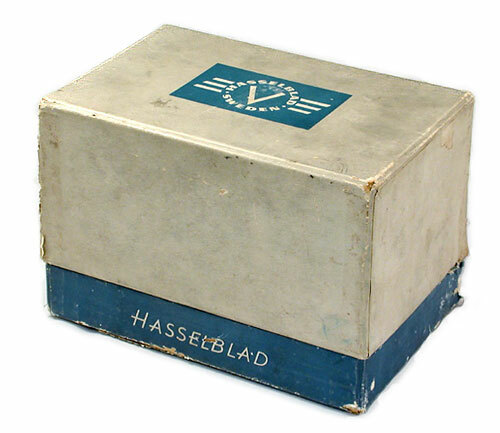 On the logo, the word Hasselblad arching around the top and Sweden cupping the bottom now constitute the circle around the V. The color remains light creamy gray and light blue as in the previous box. The inscriptions along the base remain as in the box above, but the end logos (flying V’s) are absent. The differences between whether the box contained a 1000 F or a SuperWide is evident if all the packing material inside the box has survived. 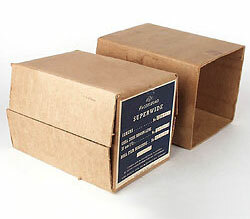 The SuperWide box has the specially folded SuperWide restraints found inside. The interior of the box had additional protective, corrugated cardboard panels in place to keep the camera from shifting about. The 1000 F generally has only a piece of corrugated cardboard on the bottom of the box – cut to match the size of the bottom of the camera. If the outer box sleeves are intact, the label would have identified the camera and serial numbers of the contents inside. The outer boxes are the same style as described earlier – two corrugated outer boxes protecting the inner box secure protection. The combination of an outside corrugated long dimension slip cover protecting a corrugated box with flaps that held the printed 1000 F box inside. The dimensions of the assembled package was 19 x 14.7 x 14.2 cm high. A 12.5 x 12.5 cm light blue label was affixed to one end of the corrugated exterior box. The camera/lens/magazine were placed in a perforated plastic bag before insertion into the 1000 F box. In addition there was a registration card, light blue instruction book and magazine instruction card packed inside. As an example of the different styles, a photo below shows the differences between the boxes for a 20 mm extension tube in Types 1, 2 and 4. Text and photos copyright 2006 - Rick Nordin and Charlie Chernoff. All rights reserved.